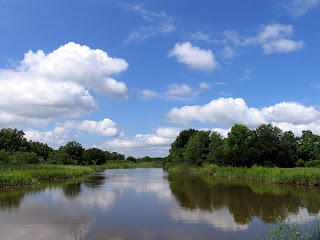 If you take a ten minute drive outside of Savannah and cross the Talmadge Bridge, you will come to a large area of woodland marsh called The Savannah National Wildlife Refuge. This was the site of rice plantations in the 1800s but now it is a protected area where you can find all sorts of beasties. It was a sunny day when I went. This was a little unusual since it has rained here almost every day (at least it seems that way). There is something I really like about swamps. I guess I expect to find a witch or something. Or maybe a voodoo priestess. On both accounts, I was disappointed but the refuge overall was a great place. Another reason why I like the southeast is the abundance of Spanish Moss. 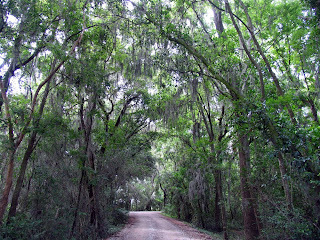 It hangs from the trees (especially the live oak and bald cypress) and gives a general creepy gothic appearance to roads, marshes and cemeteries. Spanish Moss is not a true moss; it is an air-plant, otherwise known as an epiphyte so it gets all its nutrients from the air or water. It hangs on the trees for company, I guess. Of course, there were lots of insects. 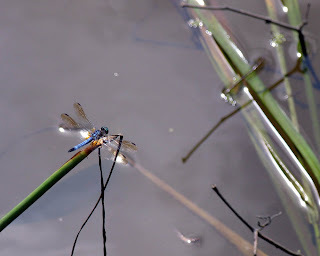 Dragonflies are cool, aren't they? Kinda like flying jewels. 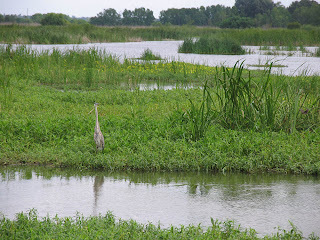 I think this is a Blue Heron. Not sure though. I'm not a bird watcher and he was far away. He didn't come over and say hi, which was a sure sign that he was just visiting from the North. I'm sure a polite Southerner would have made my acquaintance. 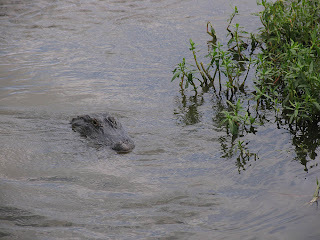 I saw a couple of gators too. They weren't friendly either, which was fine with me. Apparently you can eat gator. The meat is low in cholesterol and high in protein. I haven't tried it yet but I suppose if they served it in a won-ton, I would make an effort to ingest it.